Helicopter Parenting is a parenting style first used by Haim Ginott in his 1969 book, Parents & Teenagers, by adolescents who felt their parents hovered over them like a helicopter. Other terms include lawnmower parenting, cosseting parenting, bulldozing parenting. It means a kind of 'over-parenting' that is overcontrolling, overprotecting, and exceeds responsible parenting. Typically these parents take too much responsibility for their kid's lives and specifically, their successes and failures. Another source of helicopter parenting is living in neighborhoods and school districts where it is common and thus parental peer pressure pushes the parent to over control and get over involved in their kids' lives. Guilt over not doing what other parents are doing is often the culprit. It's difficult to have great intentions and yet cross the line over what your child actually needs and desires from you. We do want parents to be engaged, give lots of positive attention, and help when requested. The problem is that once parenting becomes ruled by fear and anxiety, this is transmitted to the children and teens. Further it undermines the child's self-esteem. Children miss the opportunity to find that they can take on challenges and succeed on their own. It also undermines the notion that success isn't everything, but the process of learning is just as or even more important. Mistakes, failures, and challenges teach skills and help kids bounce back and want to be curious to learn and discover even more. If parents are always there on the rebound when a child hasn't mastered a skill or tried something on their own, they deprive their children of learning coping skills. Children need to cope with frustration, disappointment and the stress of failing in order to grow. Letting our children struggle is a gift, not a deprivation. 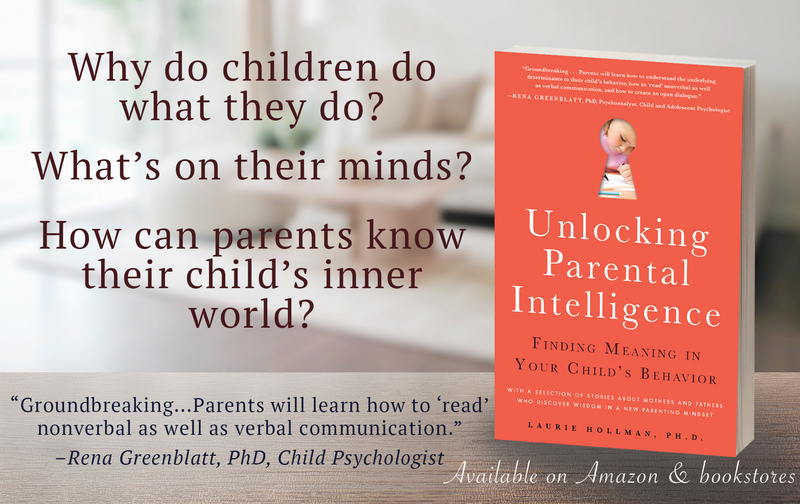 It's important to take a step back from solving our kids' problems so they can become self-reliant, resilient, loved kids who enjoy adventuring, discovering, and reaching for new learnings. Laurie Hollman, Ph.D. is a psychoanalyst and author of Unlocking Parental Intelligence: Finding Meaning in Your Child's Behavior, found on Amazon, Barnes and Noble and wherever books are sold.